Women's Handmade Diamond Bangle : LOVE2HAVE in the UK! A handmade diamond women's bangle made of solid sterling silver. 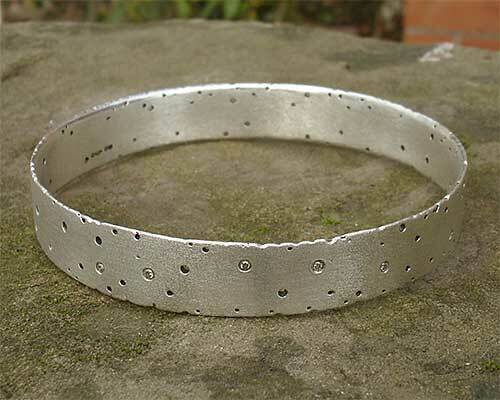 This sterling silver bangle features the same exquisitely handmade textured surface that also features on our gold and silver wedding rings on our website from the same collection. There are a total of twenty-four diamonds in varying sizes, averaging 1.4mm diameter, expertly flush set using a 'rub over' technique.